Nazraeli Press, 2011. 128 pp., 60 color illustrations, 13½x17". In March of 2009, amidst the rumblings of a global financial crisis that was to shape zeitgeist for years to come, Jamey Stillings set out on a road trip to reinvigorate his creative spirit. What he encountered would captivate, challenge and amaze him. 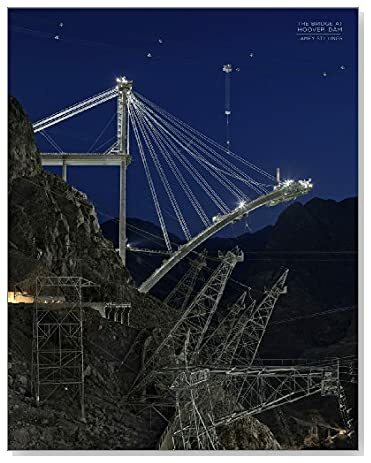 Like a child suddenly finding himself before the world's largest erector set, Jamey had discovered the Bridge at Hoover Dam. Instantly, he knew he would dedicate himself to exploring and documenting construction of the bridge through its completion. Over the course of two years and set against the cultural and economic backdrop of our time, Jamey created a body of work that echoes the Bridge in its ability to simultaneously celebrate the power of human spirit and ingenuity while inviting an examination of the intersection of nature and the hand of man. Against the temporal landscape of economic hardship, an eerie historic echo of its neighboring Hoover Dam, and the flashy and impermanent cultural landscape of Las Vegas, the Colorado River, Black Canyon and the Bridge that soars over are natural and manmade symbols of immutability and wonder. Together, they are a legacy at which generations will marvel and Stillings’ images are imbued with the awe of one in the presence of great natural powers and the acme of human effort and creativity. Jamey Stillings' work has been widely exhibited and published throughout the country. 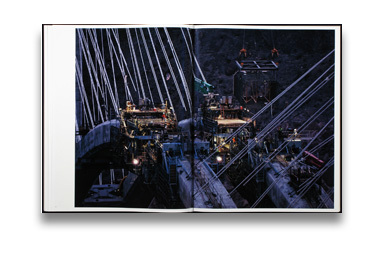 The artist's first monograph, The Bridge at Hoover Dam, is beautifully produced in an oversized format, and was published to coincide with a traveling exhibition that opened at the Phoenix Art Museum in August 2011. SPECIAL PRICE: $37.50 for signed copies, while supplies last. Note: These books will ship after August 1st. Jamey Stillings is represented by photo-eye Gallery. See his work here.